Shaun O'Hara (born June 23, 1977) is a former American football center who played in the National Football League (NFL) for eleven seasons. He played college football for Rutgers University. He began his professional career by signing as an undrafted free agent with the Cleveland Browns, and spent the majority of his NFL career with the New York Giants. He was a three-time Pro Bowl selection. O'Hara grew up in Hillsborough Township, New Jersey and attended Hillsborough High School (New Jersey). He also spent some of his childhood in Medina, Ohio. He attended Rutgers University in New Jersey, where he played for the Rutgers Scarlet Knights football team from 1996 to 1999. O'Hara's professional career began with the Cleveland Browns, where he played center and guard and after signing as a rookie free agent in 2000. While a Brown, O'Hara started 38 of 54 games, including the final 34 that he played. He signed a three-year $5.4 million contract with the Giants on March 7, 2004 with the intention of playing Center, which he considers his more natural position, as well as to help bolster an offensive line that was often criticized as one of the problems in the Giants' 2003 season. In his first year with the team, O'Hara's season was nearly ended by a case of athlete's foot, which developed into a staph infection, raising further discussion about the incidences of staph in NFL locker rooms. O'Hara re-signed with the Giants in March 2007 keeping him off the free agent market, despite initial concerns about whether a deal was possible. The Giants' offensive line has been viewed by some as one of the keys to the team's success, which was cemented following Super Bowl XLII and in the leadup thereto, but was seen as early as 2005. On July 28, 2011, he was released by The New York Giants. 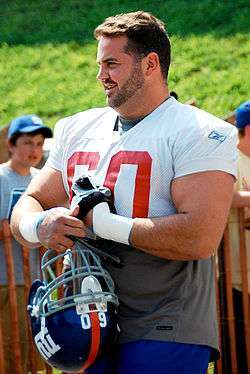 Shaun O'Hara officially announced his retirement as a New York Giant on September 3, 2012. He is now a color analyst for NFL Network and ESPN Radio. O'Hara was a member of the Giants' leadership council and was a team co-captain for the 2007 season. He is the Giants' team representative to the players' union and has been very outspoken about the role of the players' union and its leadership. He was named Giants Man of the Year for his community involvement as well as United Way's Hometown Hero in 2005 and has also worked with a number of organizations to support the communities where he lives. In March 2009, he was honored by the American Ireland Fund as one of the most noted and successful Irish American figures today. ↑ Zinser, Lynn (2004-03-08). "Giants Acquire O'Hara to Play Center". The New York Times. Archived from the original on April 19, 2015. Retrieved 2009-04-06. ↑ "O'Hara Agrees to Three-Year Deal". ESPN. 2004-03-07. Retrieved 2009-04-06. ↑ Chadiha, Jeffri (2004-09-01). "SI's 2004 NFL Scouting Report: Giants". Sports Illustrated. Retrieved 2009-04-07. ↑ "Athlete's Foot Almost Ends Giant's Season". MSNBC. 2004-11-03. Retrieved 2009-04-06. ↑ Vacchiano, Ralph (2004-11-04). "Only O'Hara's Laugh is Contagious". New York Daily News. Retrieved 2009-04-06. ↑ Canavan, Tom (2007-03-02). "Giants Sign Center Shaun O'Hara". Fox News. Retrieved 2009-04-06. ↑ "Blue Bar is Lowered. Is Just Contending Enough?". New York Daily News. 2006-12-20. Retrieved 2009-04-06. ↑ Schmeelk, John (2008-04-16). "Positional Analysis: O-Line". Giants.com. Retrieved 2009-04-07. ↑ Telander, Rick (2008-10-07). "Brotherhood of the Offensive Line". Men's Journal. Retrieved 2009-04-07. ↑ Schwartz, Paul (2007-10-18). "Giants' Front Men". New York Post. Retrieved 2009-04-07. ↑ Clayton, John (2008-02-01). "Giants' O-Line Standing Test of Time". ESPN. Retrieved 2009-04-07. ↑ Vacchiano, Ralph (2005-10-14). "O-Line Real Key to Giants Offensive Explosion". The Giants Insider. Retrieved 2009-04-07. ↑ Chadiha, Jeffri (2004-09-06). "3 New York Giants". Sports Illustrated. Retrieved 2009-04-06. ↑ Eisen, Michael (2008-12-16). "Six Giants Named to Pro Bowl". Giants.com. Retrieved 2009-04-06. ↑ Garafolo, Mike (2008-06-12). "O'Hara Comments on Plax Situation". The Star-Ledger. Retrieved 2009-04-07. ↑ Rhoden, Wiliam C. (2009-01-04). "Players Need to Be Thinking About Union's Leadership". The New York Times. Retrieved 2009-04-07. ↑ Schwartz, Paul (2008-04-11). "O'Hara: Upshaw's Ego Hurting the Cause". New York Post. Retrieved 2009-04-07. ↑ "New York Young Leaders St. Patrick's Celebration". The American Ireland Fund in New York. 2009-03-12. Retrieved 2009-04-07. ↑ Garafolo, Mike (2009-04-28). "Shaun O'Hara says Rutgers' success in draft a testament to Greg Schiano's development of program". The Star-Ledger. Retrieved 2009-06-24. Wikimedia Commons has media related to Shaun O'Hara.